Talk about hitting the jackpot: On our cruise in December, I thought I was lucky when I hit the "Lucky Ladies" while playing blackjack. The $1 bet paid out $1,000. I ended up coming home with enough money to completely pay for our cruise. My luck didn't stop there, apparently. This week I received a phone call from my Carnival personal vacation planner, Michael. Michael called to review the details of my new casino offer. I could choose from over 300 cruises and pay just $125 per person, plus taxes. Even better, I could select as many cruises from the list as I desired. We don't gamble much, so I'm very surprised by this offer. Besides a few hours of video poker, I played maybe 8 hours of low limit blackjack during our last 7 day cruise. And ZERO slots. 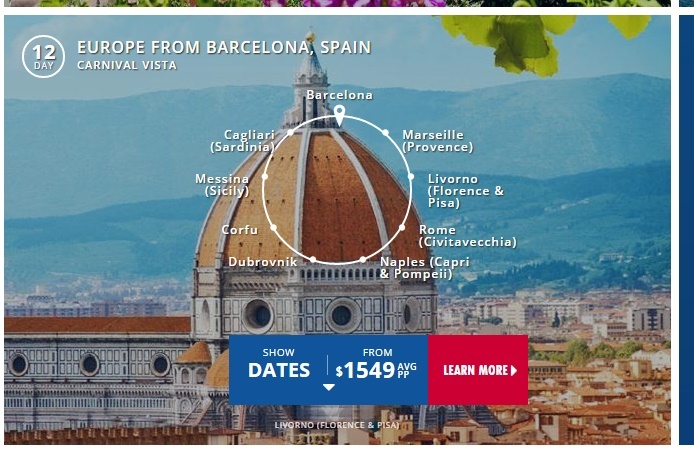 With taxes, I paid $420 for a 12 Day European Cruise, which sails in August, prime season.. Look at that screenshot up top: The regular price, before taxes, starts at $1,549 per person for an interior room. We are saving almost $3,000 on this cruise. We have booked an exterior room with a 4*3 window. It's on the Carnival Vista, a brand new ship that sets sail in April. The Vista will tour Europe for a few months before sailing to the United States. In addition to the great rate, I receive a $100 onboard credit with the offer and a second $100 onboard credit for being a shareholder. An added bonus, Delta Airlines honored what it says was a mistake-fare. When I first looked at airfares, I found a round-trip flight from Atlanta to Barcelona for $769/each. But when I went to book the flight, the fare increased to $1,774 each. I called Delta to complain, and after escalating my concerns to a supervisor, the airline honored the original fare. We also booked a second cruise out of Fort Lauderdale. It is an 8 Day Eastern Caribbean. Two of the four ports it will visit are new to us. I bought tickets on Megabus leaving the morning of the cruise and departing the day we return, so no hotel or other travel expenses will be required. This will be a super cheap cruise all things considered. January was decent. Over the last several months I bought several gift cards, mostly to restaurants. I already reported those gift cards as expenses, so the actual cash outlay for food last month was under $100. I stocked up on wine, increasing the entertainment line. But I also paid off the AMEX, so January is the last month where I will pay exorbitant interest expenses. I paid $900 to replace a crown. I didn't like how the old one fit. Finally, my health insurance went down after I re-assessed my ACA eligibility. *My discontent continues with Quicken. Long story short, I tried to reconcile one credit card account, and it created chaos and serious errors. In order to balance the account, I created a $644 miscellaneous charge.